Thinking about taking a trip to the island of Oahu? 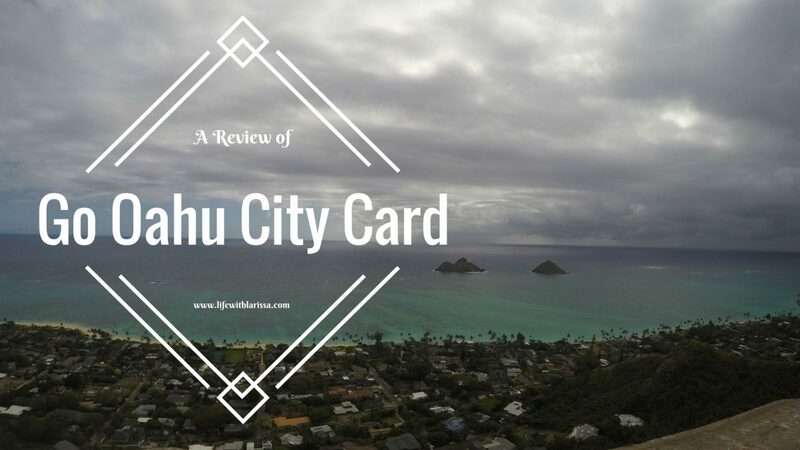 During your research you may have come across the Go Oahu City Card. Check out my thoughts on it! The Go Oahu City Card is a pass that allows you to explore the various tours, attractions, and features the island has to offer. You have the option of choosing between a 1, 2, 3, 5, or 7-day pass. You even have the option of building your own pass by choosing which attractions you’d like to include. After you decide which pass you want and you purchase it, you can choose to download it onto your phone or print it. We went with printing, and it came with a massive packet detailing everything that was included, the hours of that attraction, the address, and a short detailed description. I really liked the packet because it was easy to go through and highlight which ones were of great interest to us, and cross those off that weren’t. To use the pass, just show it at each place and you’re good to go! It is important to note that the pass has to be used in consecutive days and the pass is per person, not per group. There are so many things that you can choose to do. It would be impressive (to me), if someone managed to participate in all the offered attractions. Granted, we only had the 3-day pass, so maybe if we’d had the 7-day pass, it would be more manageable. Anyways, the pass includes various tours you can partake in –catamaran tours, day tours, city tours, hiking tours, and jungle tours. You can use your pass to rent various water equipment –paddleboards, kayaks, canoes, and snorkeling equipment—as well as land vessels, such as bikes or mopeds. You can get into water parks, museums, and shows. If you purchase the 3-day pass or longer, it comes with one premium attraction out of six. You don’t have to decide which one you’d like to do when you make the purchase, but I recommend deciding relatively soon, as you’re probably going to need to make a reservation. For our premium attraction, we chose the Polynesian Cultural Center, as we had heard phenomenal things about it! It pained me a little to spend that much money on two passes, but for us, it ended up being the better deal. If I had paid gate price for each activity we did, I would have gone well over the price I paid for the passes. The price won’t necessarily be the same for everyone, as it depends on which package you decide is best suited for you, and your travel companions, if you’re travelling with any. The one day pass won’t cost as much as the seven day pass. If you’re building your own pass, that price will fluctuate as well, depending on which attractions you include and how many. I bought my passes through Groupon, but there are other places to go. The website of the pass is www.smartdestinations.com, so you can obviously go there. You can also buy the passes through Expedia or Costco. I’m sure there’s more places this pass can be found, but that’s what I ran into when I was looking into it. The pass included a lot of attractions. With the 3-day pass, there was no way we would be able to partake in them all, but it was great to have options, as some of the attractions were of no interest to us. attraction was great. Although we would have really liked to do several of them, we enjoyed the fact that one of the pricier admission prices could be covered by the pass. Depending on how much you partake in, the pass will pay for itself. We didn’t even use it that much, and it still covered and passed the cost. Almost everything in the city closes at 4:00pm. That’s truly aggravating as it took us forever to get from point A to point B. Mostly due to traffic, but also partially due to the fact that I tend to easily get lost! You have to make reservations at most locations. Now this makes sense because they’ll have to save a spot for you, or save some equipment if they know you’re coming by. I put it on the con list though because if you’re anything like me, you don’t like talking on the phone, and you especially hate being put on hold. Sometimes it was a breeze; other times I was on hold for quite some time. It has to be used in consecutive days. There were days that we could have found use for the pass, but our 3-day window had passed. So instead of spreading it out, you have to go back-to-back. 2- planning way ahead of time [i.e. planning which attractions are close to each other and doing them on the same day]. I went on this trip with my sister and she enjoys sleeping in. Now, there’s nothing wrong with that, but when most of the attractions close at 4:00pm, it’s imperative to get out the door early. So if you’re planning on taking a trip to Oahu and using this pass, I recommend wake up early and tackle the day! Have you used the Go Oahu City Card? What did you think about it? Do you have any questions that I didn’t answer about the pass? Let me know in the comments! I got married in Oahu 3 years ago but haven’t been back since. I want to go back so badly and will definitely look into getting this pass! Your wedding must have been gorgeous!! And yes, you should totally check it out when you go. It saved us so much money! Thanks for the tip. Great featured picture! Thank you! I took it while on a hike in Oahu. And of course 🙂 Thanks for reading! Good to know that most places close 4pm! Wonder why? You mentioned making reservations at the attractions. What if you turned up without one. Will you have to wait or will you be turned away? I’m not sure why 4:00pm is the magic number, but it was rather inconvenient for us for the first few days, as we were unaware. As for the reservations, I’m not sure what will happen if you don’t make one. We didn’t chance it and made one wherever it stated it was necessary! I’m sure if there’s enough room, you won’t be turned away, but don’t take my word for it! This pass seems like a great idea for me and my hubby – we love planning and prepping our day in advance. And if I am going to save some bucks, I definitely would get out of bed early to make it worth it. Thanks to your tips! I’m glad my tips could be of help. My sister and I didn’t plan very well, and therefore didn’t use the pass to its fullest potential. But at least now we know for next time! This is such an amazing option! Oahu is on my bucket list. Your tips and review are so helpful for when I go! Haven’t been in Oahu, but I find the place interesting. It looks fun there! Oh it’s definitely a lot of fun! So many activities to choose from!